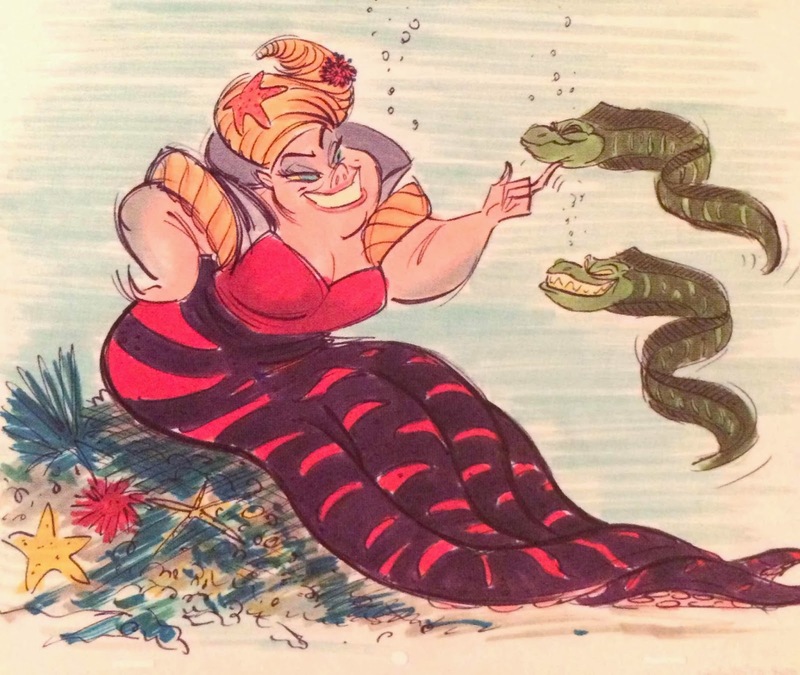 Ursula is one of the most fascinating and beloved villains in the Disney canon. She is a fierce old queen (based on Divine…) with a badass agenda, plus she has a fabulous song…but Ursula didn't always look like the diva that we've come to know and love. Oh no, the sea witch went through quite a metamorphosis before hitting the big screen. Like most Disney characters the design concepts for Ursula have been archived, and here are but a few of the images. The first two images show Ursula in two drastically different incarnations. The above picture shows a waif like sea demon…not really a mermaid, but similar and scary. 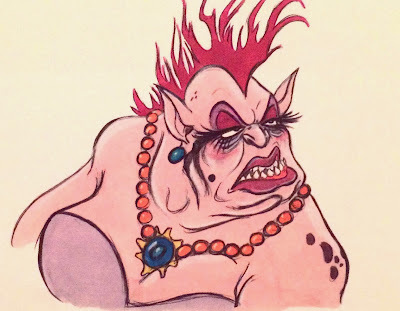 She more closely resemble Yzma from The Emperor's New Groove, and I wouldn't be surprised if they drew inspiration from this drawing. Can you imagine a skinny Ursula? These two images a pretty bizarre. The one above seems to combine the sea demon look with the heft of the abject version. She looks an awful lot like Ogre from The Dark Crystal. The last image is the closeted to the final version that we have. Not only is she an octopus, but she is also pretty heavy, and not a grotesque slob. 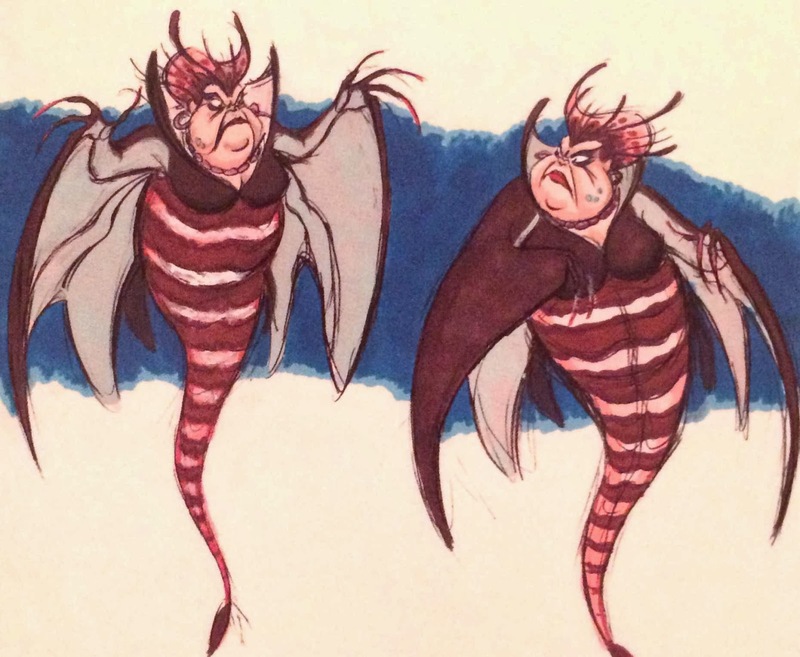 Aren't you glad that the concept and design team too their time with the finalized version of Ursula? 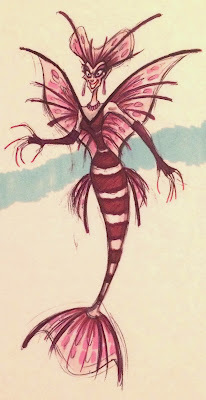 I can hardly imagine The Little Mermaid featuring any of the above villains, it would hardly be as effective as the total badass that we ended up with. Do you love Ursula as much as we do? Who is your favorite Disney villain? Let us know over on Twitter! Or on our Facebook page. LOL - I think you meant to say "closest" not "closeted"